Red Sonja is on a pretty damn good kick right now. She has her own monthly comic that was recently relaunched and has been doing really well. It also helps that it follows a fairly successful and long run that continues to be collected in trade paperbacks. There is an upcoming crossover series involving her and Brian Wood’s Conan. And then there’s Legends of Red Sonja a new mini-series that started this week and furthers the, well, legend of the She-Devil with a sword. When Gail Simone and Walter Geovani launched the new series a few months ago, the first issue had a number of cover variants that were all drawn by some of the industry’s top female artists, including the original cover. With Legends Gail has turned that thing around and the stories in this anthology-style series are all written by some of the best and biggest female prose and comics writers. But this is not a typical anthology series, it is quite different, and that is something that works to the advantage of this series quite well, going by the first issue. The first issue in this anthology series has a rather unique structure. Gail Simone writes a framing story and then Nancy A. Collins and Devin Grayson write sections of that framing story such that there aren’t three distinct stories but a single story that tells two different legends of Red Sonja. Its a really interesting approach and something that I quite liked for the fact. I think I may have read that the structure of each issue was going to be like this, but I don’t really remember and as such it was a nice surprise of sorts. The premise is that there are twelve murderers of renown who have come together to hunt down and kill Sonja because she murdered their leader, a Prince. That’s the framing story provided by Gail and it has a really interesting narration, quite formal and even a bit wordy in places. Some of the narration feels a bit stilted but it still provides an interesting framing story which I hope Gail can use down the line for the main series. Nancy’s short story, Eyes of the Howling God, the uses the framing story to launch in a side narrative that tells of Sonja as a thief, come to Stygia after things got too hot for her with the Merchant-Princes of Shem. Here, Sonja goes up against a supernatural monster while on a job, which complicates things but she ends up winning through anyway because she is quite handy with a sword. Its a simple story for the most part, and it has s few good moments that set it apart. A couple of narrative decisions jumped out at me as weird, but I’m willing to let them pass given the length of the story and the fact that there isn’t a lot of room to explain them. Devin Kalile Grayson’s La Sonja Rossa then jumps off from the ending of Eyes of the Howling God, and tells a very whimsical sort of story as the two of the murderers hunting Sonja question the captain of a ship about her whereabouts. This story is much more in the style of nautical sword and sorcery which starts out a little rough when the captain starts narrating Sonja’s fate, but ends up being really good by the end because of the twist involved. And it all continues to build Sonja’s legend, albeit in a very humorous manner. The art for the Gail Simone pages is by Jack Jadson with Noah Salonga doing the art for the Nancy A. Collins pages and Carla Speed McNeil doing the same for Devin Kalile Grayson’s pages. Each of them has a different style that meshes together really well in terms of overall style but is distinct all the same. Jadson’s Sonja is very different from McNeill’s, and this is something that threw me off. I’d have expected them to be different if the stories were completely different, but that’s not the case here. Still, each of them does really well at depicting the secondary characters most of all. And the surroundings of course. Salvatore Aiala Studios handles the coloring duties for this issue and that aspect lends consistency to the issue where the pencilwork often doesn’t. Great effort all-around. Overall, this was a fairly solid issue, and is the start of the larger story. I expect the next few issues will be along the same lines and continue to build on Sonja. None of the stories here are from Sonja’s own perspective which does well in creating a sense of mystery around the character. And that’s something I enjoyed. Looking forward to next month’s issue! 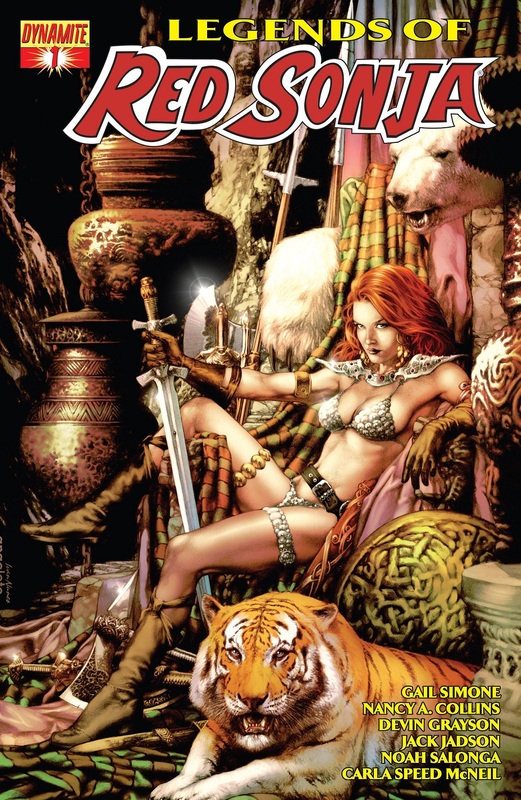 More Red Sonja: #1, #2, #3, #4. Posted on November 7, 2013, in Comics Reviews, Review Central and tagged Carla Speed McNeill, Comics, Comics Review, Devin Kalile Grayson, Dynamite Entertainment, Fantasy, Female Protagonist, Frank Thorne, Gail Simone, Jack Jadson, Jay Anacleto, Legends of Red Sonja, Nancy A. Collins, Noah Salonga, Red Sonja, Review, Review Central, Salvatore Aiala Studios, Simon Bowland, Sword and Sorcery, Warrior Women. Bookmark the permalink. 17 Comments.